I wanted to share with you guys a little project that we've been working on. RMSGear is going to roll out with our own broadhead line, we've about got the first two broadheads ready to bring to market. There are a few hang ups in accomplishing exactly what we want. But we're getting close. We were single bevel before single bevel was cool. We have personally hunted with this design for a long time, and we wanted to see it done in a solid piece of steel. Simply put, we couldn't find what we were looking for to use for ourselves. My first hunting season was 19 years ago. I tuned my cedar arrows to my Wapiti Spike longbow, and tipped them with a Grizzly broadhead. I was ignorant of broadhead designs back then. I just used the broadheads my Dad had laying around. My Dad only bought Grizzlys because he walked into Bob's Archery store, and Bob told him that a Grizzly would penetrate well for him and his young sons. 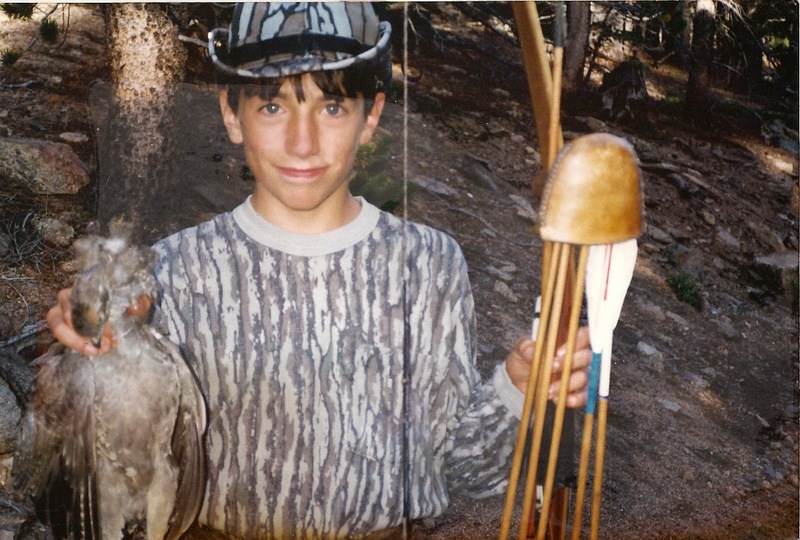 This is one of the first days I carried a bow in the woods and a big game tag in my pocket - 19 years ago. To this day this is one of my proudest shots. My Grizzly broadhead cut this grouse's heart in half. Those Grizzly broadheads worked well for us. As soon as I got my driver's license my younger brother and I were in the elk woods every day. We had good grades and understanding parents, so my Mom and Dad smiled and told us good luck when we asked if we could skip school and go elk hunting. 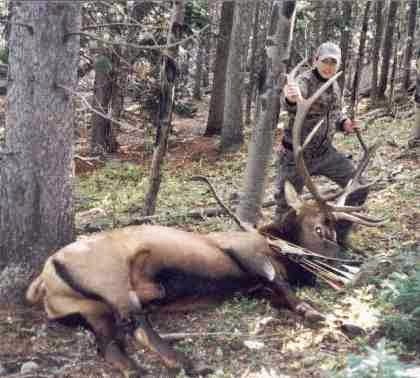 My brother was the first one to kill an elk - the holy grail of hunting in our minds. He had just turned 16, and shot a P&Y bull on a school night with me hiding right behind him. His arrow was propelled by a 47# Wapiti recurve. Danny center punched ribs on both sides of that elk, and he still got an exit hole. Could he have done that with another style of broadhead? Maybe. But the hook was set, Grizzly it was. Danny has not killed an elk with his recurve with anything but a Grizzly to this day, and he has a nice tally of bull elk for a 31 year old kid. So to make a long story short, we're not getting into this project because we think there is a single bevel fad, or to jump on the bandwagon. We're looking to build the broadhead that WE want to hunt with. Since we couldn't find it on the market, we decided to do it ourselves. Why solid steel and not brazed? 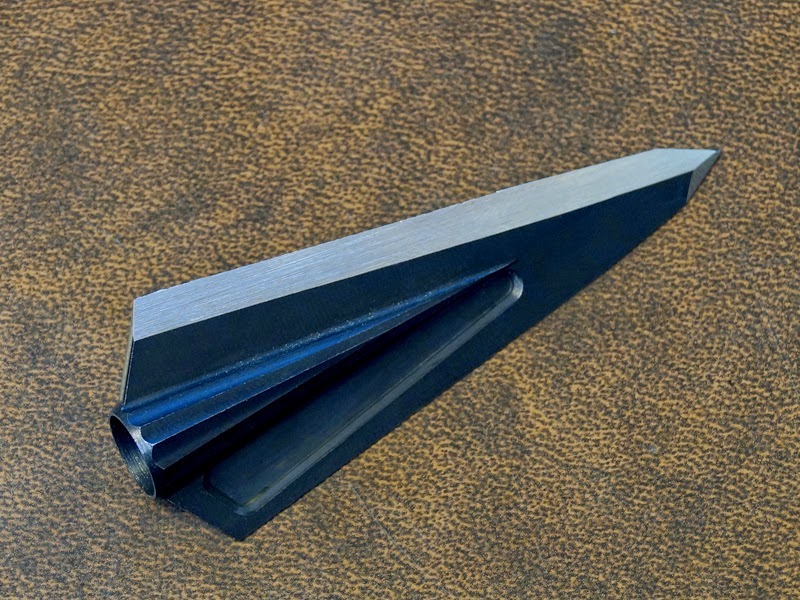 Brazed broadheads in this design are common, available, and relatively inexpensive. There is no need for another brazed or welded single bevel head. We have shot them for years with excellent results. They work. But they have their draw backs. 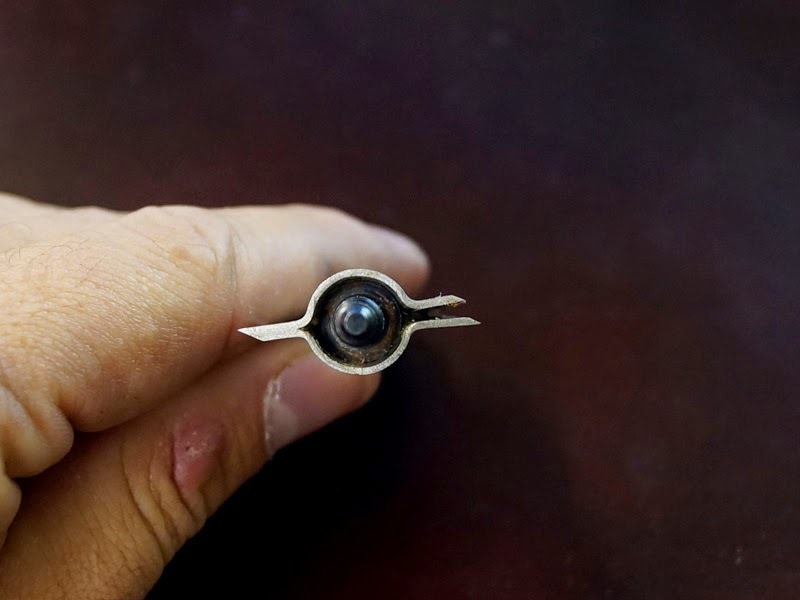 Most broadheads don't spin up true, and some take a lot of work to mount somewhat straight. They are also not as tough. You can see the broadhead in the picture below. I shot a bull moose with this broadhead. I consider this a broadhead failure. This was the final straw in our quest for something else. This is a major drawback of brazed heads. We want a broadhead without braze lines. Something that mounts straight and spins true with minimal to no effort. 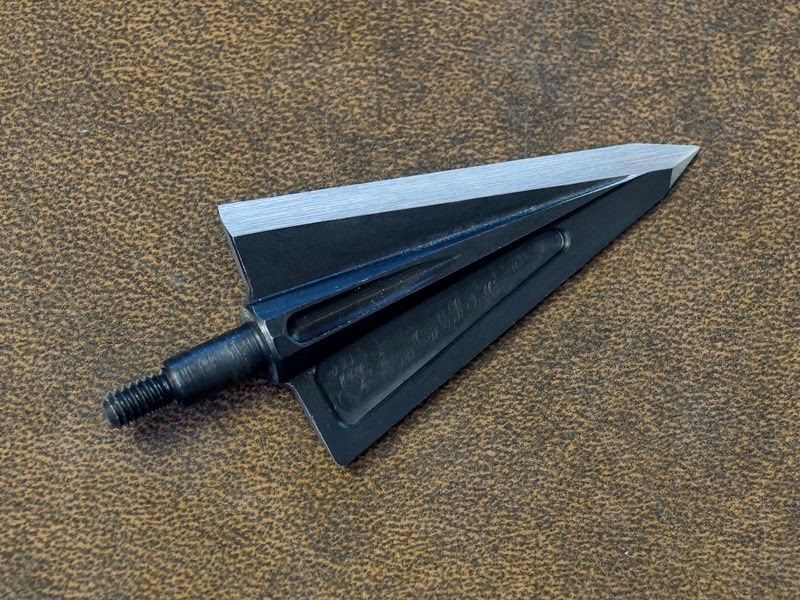 We want a one piece, solid steel, thick, tough broadhead. And oh yeah, we don't want to skip a car payment to afford them. We want a broadhead that is as long as possible, while still light enough to meet popular weights. We plan on filling in on weight and bevel options after a while, but for our first "test" run, we've got 200gr screw-in, and 160gr glue-on. Both in left bevel. Naming them has given us a lot of fun and "spirited" debates. Here's what we're working with at the moment. My Dad wasn't thrilled about the name "Cutthroat". He thought that it was too in line with the current broadhead hype marketing garbage. I think he was envisioning a logo with a bloody deer and a big slice across it's throat, with blood dripping off of all of the letters. But that is not where the name came from. High mountain basins hold a special place in our hearts. Our dad took us on hikes into them as soon as we were old enough to physically be able. We have caught a lot of trout in those basins, seen a lot of big bucks and bulls, and developed some strong bonds up there. We chose Cutthroat because it is the Colorado state fish, and a fish that gave us a good reason to spend time in places that are quite special and near to our hearts. Cutthroat trout live in wild places, places I don't visit near enough. Besides, all the fierce animals already have broadheads named after them. Why not a fish with a cool name? Of course when we got the broadheads in the mail we were excited to see how they stacked up to some abuse. We looked around our store and found the hardest thing on hand. We didn't know what to expect when we shot into the biggest piece of steel in our store. We had no idea what to expect. But we were pleasantly surprised to see it bury in this piece of steel. So naturally we had to shoot another broadhead that we like to see what would happen. The hole on the left is from a Cutthroat. The dent on the right is from a brazed broadhead of equal weight. It sounded like glass shattering when we shot the steel with the other broadhead. These are literally the only two pieces that we could find. 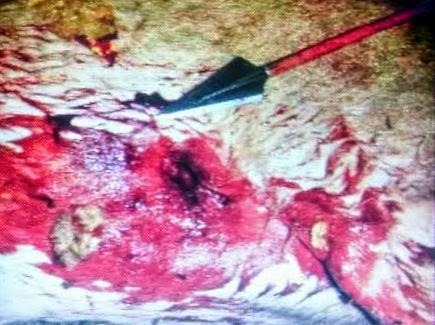 The first bowhunter to take the field with a Cutthroat broadhead killed a deer on his first evening. He's still in the field at the time of this writing, and I will update this blog with a high quality picture when I get it. In the meantime, this is what I got. I'd post a picture of the entrance, but I gotta say, entrance holes have never concerned me in the slightest. Show me the exit or don't show me anything! We haven't even had these broadheads a week, but you can bet that we're going to shoot them at a deer or two in the coming weeks. More hunting pictures to come! At the time of this writing three whitetail deer have fallen to Cutthroat broadheads. Early field testing is looking good. We made a fairly small initial run. We are not currently set up to do large scale grinding. We have spent the last week or so trying to develop the easiest method to grind these heads. We are not the kind of people to try and rush to market with a product that hasn't been tested extensively. Heck, I've been shooting a simple tab design for over a year and I've yet to package and sell one. Nonetheless, we will start accepting orders, and we will start building a pre-order list for our next batch. This week I got these broadheads into the hands of some of the best hunters I know. I promise you that we are going to be more judgmental and harder on these broadheads than any others we've used. There's not going to be any marketing tricks here, no doctored images, no hype, no bullsquat. I'm going to be extremely nit picky so that you do not have to. The broadhead speaks for itself. It is a time tested and proven design built in the toughest manner possible with the technology of the day. A couple hundred years ago it was obsidian, then steel, then welded, brazed, and now machined. You can order through our website, at this link. Orders will be slow to go out the door at first, we're still experimenting with the best ways to grind, and we are all going to be in the field over the next few weeks. We are going to let the response dictate how fast we expand on weight and bevel options. You can follow us on Facebook. We'll be updating our customers about Cutthroat broadheads both through our RMSGear Facebook page, and also Cutthroat Broadhead's Facebook page. Be sure to sign up for our newsletter so that you can get updates on Cutthroat Broadheads and other RMSGear news.